Rule Britannia: Kebab shop fights back. Photograph: Ed Sheridan. A Hackney kebab shop has fought back against police claims that it has been advertising later opening hours than its licence allows. 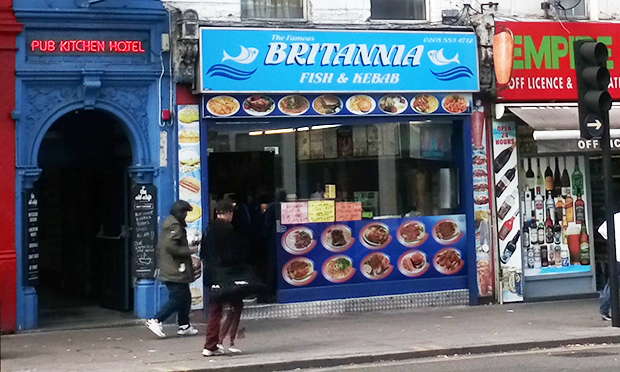 The Britannia restaurant, which opened on Mare Street in 2002, applied for an extension to their closing hours to Hackney Council’s 6 September licensing sub-committee of 4am on weekdays, and 5am Fridays and Saturdays. The stated intention of the restaurant’s application was to better compete with their neighbour BBQ Xpress, which is licensed to open until 4am seven days a week. However, operators stated they were ‘shocked’ to learn of Hackney police’s opposition to the application. Police provided to the sub-committee of Britannia’s profile appearing on listings websites Zomato and All In London, advertising the shop’s opening times as up to 6am. Huseyin Durmaz, speaking to the Citizen, denied all knowledge of the listings, claiming he first read about them in a Hackney Gazette article based on the public agenda for the sub-committee. Durmaz said: “I was shocked, believe me. My next-door neighbour told me about the article. Britannia claimed that they were not aware of any communication from police regarding their application. Umit Suleyman, who spoke on behalf of the operators to the sub-committee, said: “It would be good for someone with technological skills to help us take it down. “We always close at 2am, maybe one or two minutes after, but never later. “We’re trying to create an image. We stopped selling alcohol three or four months ago. “Part of why we want to be open later is for people who are fasting and don’t want to wake up their families in the middle of the night by cooking a meal, or people who are awake for early morning prayers. “We are willing to do anything to be helpful, and want to work in the interests of and for the betterment of the community. A decision on Britannia’s application was postponed by the sub-committee, as police were unable to attend to present their objections. Cllr Peter Snell (Lab, Dalston), who chaired the meeting, said: “We’ve been out the back and had a chat about this, and we want to be as fair as possible. “We feel we have a lack of information about how the police would respond to this, so we think the fair thing to do is to adjourn the meeting so police can come back to us.